What It’s About: Rudolf Rassendyll (Stewart Granger), an English aristocrat distantly related to the royal family of Ruritania, travels to that country for the coronation of its new king. As it turns out, Rudolf is almost identical in appearance to the new king, and he ends up impersonating him after the real king is abducted by his scheming half-brother. Can Rudolf carry off the act honorably, even when he finds himself falling in love with the king’s intended bride? Based on Anthony Hope’s 1894 novel. Why Watch it Today? 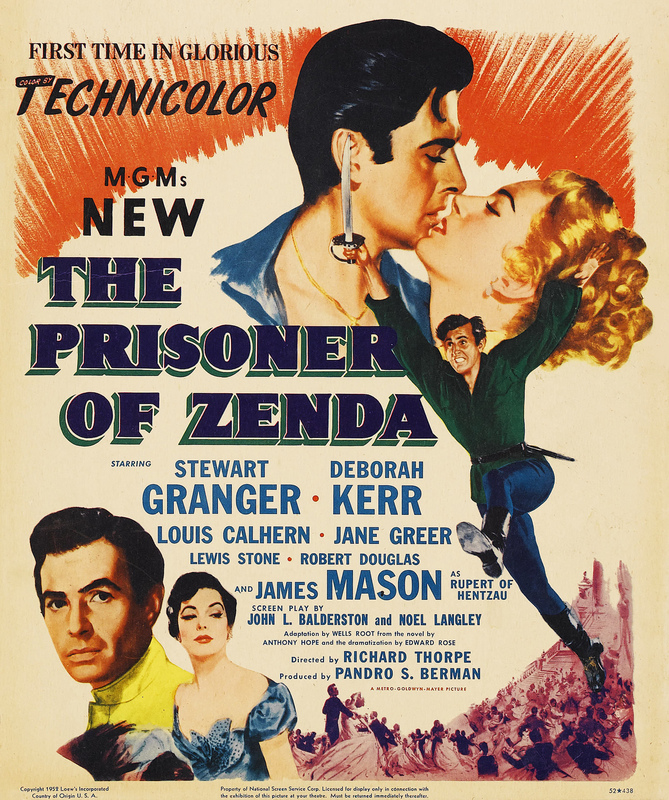 : Alfred Newman, who won an Oscar for his score for the (previously reviewed here) 1937 version of The Prisoner of Zenda, also scored this version. Disappointingly, this Alfred Newman is not that Alfred E. Neuman. He’s a prolific Hollywood composer who won nine Academy Awards; he definitely didn’t deserve one for this score, which is pretty generic pomp-and-swashbuckle and nothing to write home about. On the other hand, I never miss an opportunity to re-read or watch a version of this great adventure. All the film versions draw on earlier silent and stage adaptations, particularly that of Edward Rice. My personal favorite is the 1984 BBC mini-series, which is sadly impossible to find. So, with all these options, including two by today’s composer, why watch this particular one? Well, it’s amusing. Rudolf/King Rudolf is pretty leaden and — in the first color adaptation of the book — distinctly lacking the trademark “Elphberg Red” hair. And fight choreography that’s charming enacted by Errol Flynn in the 1930’s looks ridiculous on Granger in the 1950’s. A special treat is when he swings through the trees during the pistol battle at the summer house. James Mason provides the acting highlight as a suave Count Rupert of Hentzau, doing a more credible job than he provides in the following year’s The Desert Rats, where he reprises his role as Field Marshal Erwin Rommel. Of course, if “goofy swashbuckler” isn’t what you want to watch today, just do yourself a favor and read the original book. I do so every year or two — it’s that much fun. This entry was posted in Action, Adaptation, Adventure, Based on a Book, Drama, Mistaken Identity, Movie of the Day, Period Film, Remake, Romance and tagged Alfred Newman, Anthony Hope, coronation, Deborah Kerr, fortress, impersonation, James Mason, Jane Greer, king, MGM, mistaken identity, rescue mission, royal wedding, Ruritania, Stewart Granger, Zenda.